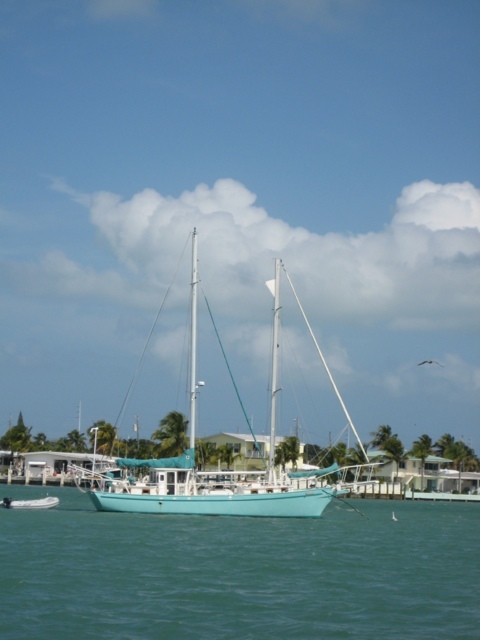 The prevailing winds in the Florida Keys are easterly, unlike the Lakes where they are southwesterly or variable. Here in Marathon’s Boot Key Harbor, we are “wind bound.” When we came in last Saturday evening, the wind was strong northeasterly. It turned strong easterly on Sunday (20 to 25 knots) and has remained like that for the last 3 days (and predicted the same for 2 more days). 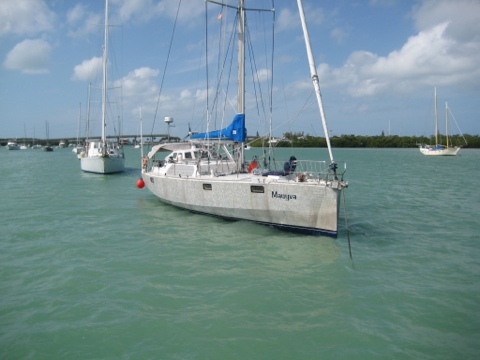 The result is that no one is moving–many boats plan to head from here to the Bahamas, but the winds are not favorable. We anchored on Saturday in the crowded anchorage and got on the waiting list for a mooring ball. But we are stuck in the crowded anchorage, since no one is leaving. The harbor office predicts that there will be a big exodus once the winds change, but we are still not at all sure when we’ll get a mooring. So we are riding the dinghy upwind to the dinghy docks (getting salt soaked), having a decent time on shore, getting real showers, doing laundry, going to Publix, Jo doing yoga and the crafts group. But still wind bound, hesitant to leave the boat longer than necessary. One of the interesting things about cruising the Keys is seeing the unusual boats, like the 45-foot aluminum sloop, Mauyva, from the Netherlands (below). Bare aluminum, unpainted, with zincs hanging over the sides, built like a tank. Or the schooner near us (pic below) with a furling in-mast topsail, not your average ancient schooner. Good evening. We are fellow GLCC members. My wife and I also seek winter refuge in South Florida during the “off season” Up North. We must have crossed paths on multiple occasions during the summer of 2011. If you remain windbound in Marathon and need a change of venue (once you get a Marathon mooring ball) you might enjoy a cocktail hour on our porch some windy afternoon. Of course, we enjoy afternoon cocktails in calm weather also… In either case, the porch is rock solid and errant boat motions do not threaten to topple a Hendrick’s martini here. We are holed up in Tavernier until spring launch in Lake Michigan. If you would like a Great Lakes cruisers’ gam just email us at the email provided below.